…a closer, more authentic connection with your partner? …more intimacy & sensuality in your relationship? …a greater level of understanding of each other? …some new ideas & techniques to play with in the bedroom? …a great weekend of fun and exploration of yourself & your relationship? Then this is the weekend that you have been looking for! In response to overwhelming demand for more(! ), we have created these fun new playshops to share with you real-world practices that can easily be integrated into your daily routines and help you to bring more authenticity and honesty into your relationship. This weekend is suitable for all couples who wish to bring more sensuality and a sense of deepening into intimacy within their relationship. The invitation is to slow down from our normal daily lives and explore the finer subtleties that normally get missed in the busyness of the everyday. As with everything that we offer it will be practical, fun, down-to-earth and life-changing. 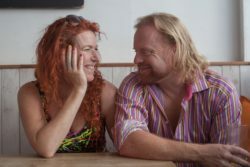 You don’t have to have any previous experience with Tantra or workshops, just a willingness to explore, a desire to go deeper, and a healthy sense of humour!